In April of 2013, anthropology and physics major Camila Uzcategui spent a weekend with more than 100 people she had never met before at the GlobeMed Global Health Summit. She left feeling she was part of a movement and a global community. GlobeMed is a network of universities that work in partnership with grassroots health organizations in developing countries to design projects to improve the partner community’s health. GlobeMed matches each university chapter with a unique grassroots organization for a long-term partnership. After applying and being selected to establish the FIU chapter of GlobeMed, Uzcategui dove head first into the GlobeMed founding experience. In addition to attending the Global Health Summit, she participated in the fall Leadership Institute and assembled a team of peers to work alongside her. As the founder of FIU’s GlobeMed chapter, Uzcategui will travel as a Grassroots On-site Work (GROW) intern to our partner organization, EDELAC, Escuela de la Calle, in Quetzaltenango, Guatemala this summer. There she will work hand-to-hand with the chapter’s partner organization to promote health equity. Uzcategui’s internship is supported by the Global Health Fellows Program II. The program, led by the Public Health Institute, helps the United States Agency for International Development (USAID) address its immediate and emerging human capital needs by developing a diverse group of global health professionals. Chapter president, Camila Uzcategui, at an outreach event at FIU’s Farmer’s Market. During the year, the chapter and the partner communicate bi-weekly via Skype and email, building a strong relationship and defining a project that the chapter will support throughout the year. On campus, students advocate for the partner organization and further dialogue around social justice and global health issues. They also fundraise to support their specific project goals. During the summer, a select group of students travel to their partner site. This past semester the chapter held an outreach event at a Farmer’s Market and a global health discussion event to recruit new members and establish partnerships with already existing groups on campus. A strong internal infrastructure, with the Office of Global Learning Initiatives (OGLI) as the hub of coordination and communication, accounts for the FIU chapter’s early success. 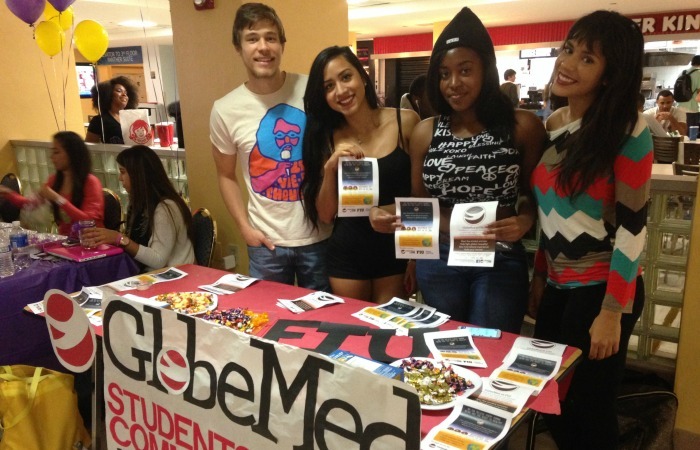 GlobeMed considers FIU the flagship example of an effective chapter because of its strong relationship with the OGLI. The OGLI opens doors for efficient student access to critically important resources associated with space and scheduling, policies and procedures, and communication technology. The OGLI coordinator, Eric Feldman, mentors the student leaders, offering guidance concerning productive organizational and communication strategies. 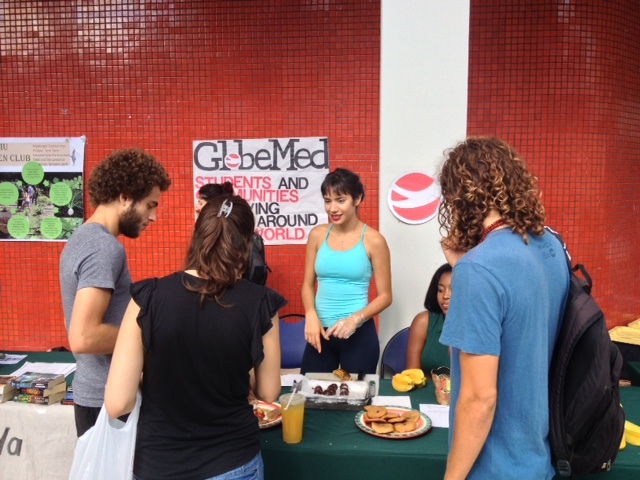 Cody Taffet, Erika Barrios, Danielle Taylor and Camila Uzcategui at a GlobeMed bake sale in GC. Looking forward, the next semester includes preparation for the members traveling abroad, fundraising and advocacy events on campus including World Day of Social Justice on February 20th, and attending the national Global Health Summit, where FIU will send delegates to join over 200 students from across the country, for a weekend of panels, workshops and networking with professionals in global health and social justice. To find out more about GlobeMed @ FIU and how to join the club, go to the club’s Facebook page or the National Office website. If you are interested in other global learning opportunities, visit GoGlobal.fiu.edu.